This Supper Cloth is a rare and unique article which perpetuates the memory of 114 young men who participated in the Australian Imperial Forces during World War I. The names of the young men are embroidered on the cloth and many of the surnames are those of long time pioneering families, some of whom still have descendants living in the Port Macquarie/Wauchope area. Needlework has always been a popular pursuit for women as it can be undertaken individually or as a group activity. It can provide a creative outlet, but also therapeutic comfort during times of stress. In addition, although hands may be kept busy, it is also possible to engage in group conversation at the same time, thus helping to consolidate friendships and provide support for members of the group. It is not known if the Supper Cloth was made by one person or several, but no doubt it helped provide a positive and tangible focus for the women involved, and perhaps a slight distraction from the daily concern about their loved ones. The Australian Comforts Fund was established in August 1916 to co-ordinate the activities of all the State based patriotic funds which had been established earlier in World War I. These were voluntary organisations, run mainly by women, which provided and distributed free ‘comforts’, such as knitted garments and food items, to the Australian ‘fit’ fighting men in all of the battle zones throughout the world. 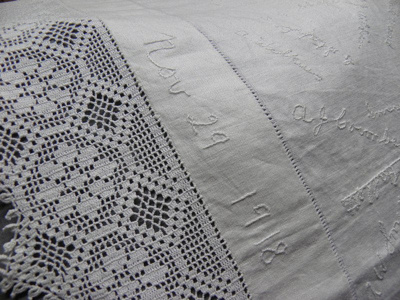 Because of the considerable amount of work involved in embroidering the names and crocheting the edging, it is likely that the cloth was started before the end of the War. Possibly those who made it and donated it to be raffled on War Chest Day, added the “War Chest 29 Nov 1918” embroidery panels later and especially for that purpose. The Supper Cloth was won by Miss Doris Hallett who was 17 years old at that time. She was a member of the War Chest committee holding one of the two “Collector” positions. The ‘War Chest’ was the NSW Fund of the Australian Comforts Fund, and Port Macquarie/Wauchope residents contributed to the War Chest Fund No. 12. Newspaper articles and advertisements show that 29 November 1918 was celebrated throughout NSW as “War Chest Day” but the Port Macquarie War Chest Committee advertised the 30 November 1918 as the last fund-raising event to be held by that group. Over ₤100 was raised from their final effort. Do you have a list of the names on the supper cloth? My ancestors were early pioneers in the Port Macquarie area. It's a lovely and significant memento of days and times of a stressful period in our history.